Repair Broken Snow Globes & Hearts Daily. Restoring Your Sentimental Heirlooms! 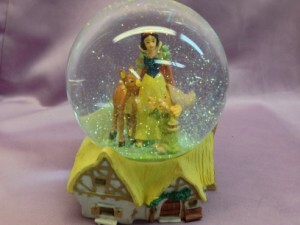 With over 25 years experience in the music box industry, we can make your treasured snow globe like new again! Broken Snow Globe? Glass Broken? Cloudy water? Figurine Loose - Floating around? - Music Not Playing? Broken Pieces - Arm, Leg, Angel Wing, Head etc? These are some of the question we get on a daily basis and the answer to all of them is "Yes" we can restore you priceless and precious musical snow globe or music box back to new again! With more than 25 years experience in the music box industry, we astonish, delight and surprise clients everyday with the repaired results. Many clients think that their precious heirloom is beyond repair and are amazed at the finished heirloom. We receive thank you cards, phone calls and emails, almost on a daily basis from happy customers all around the united states and Canada and sometimes even worldwide, because this service is such an art and very limited to craftsmen who can do this type of work, some countries do not offer these kind of repair service. Music box repairs are normally completed and shipped back, within a few days to the owner in less than week in perfect working condition. Snow globes as simple as they look, are a little bit more complex and require daily work for about 7 days or more to complete the fluids, remove the air bubbles and settle the glitter or snow in the globe. Sometimes it is impossible to remove all air bubble due to air that gets trapped in certain figurines. 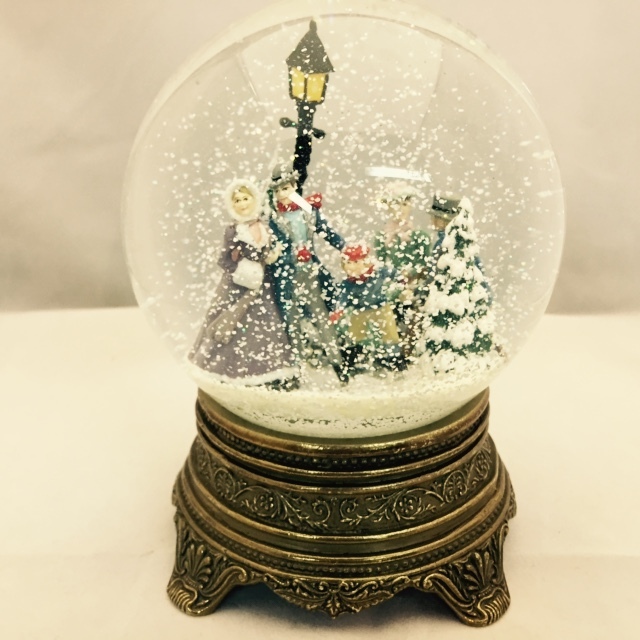 Snow globe manufacturers do not consider air bubbles a defect in workmanship and have a disclaimer with all new snow globes. We restore all brands of snow globes including San Francisco Music Box Company, Christopher Radko, Kirkland, Hallmark, Lenox, Disney, Macy's, Waterford, Things Remembered, Partylite, Hallmark, Dept 56 and Fontanini by Roman to name a few brands. We receive client's "thank you" cards, phone calls and emails from happy customers on almost a daily basis and they are all deeply appreciated. Listen to this message left on the answering machine the other day from a delighted customer. Annie .. we do appreciate you taking the time to call and tell us you love the restored snow globe! Thank you so much for restoring my music box/water globe. I was thrilled last night to see how beautifully it turned out! I haven’t seen it look so sparkly and pretty for several years. Considering it came to you in multiple pieces, I feel like you are a miracle worker. It has been a pleasure working with both of you. Thanks again for sharing your talent and restoring this family heirloom. My kids may not appreciate my excitement right now, but some day they will! *Important - Please read instructions below before shipping. Make sure you pack you treasured snow globe, figurine or music box very securely in a box or wrapped in bubble wrap and then use at least 2" or more of packing around the item with bubble wrap, Styrofoam peanuts. Even though your item maybe broken, you do not want to create any more damage during shipping and this can be avoided by just taking a little time to pack it well. Any broken peices include in a zip lock plastic bag attached to your information letter with tape or staples. Do not send any loose broken glass pieces in the package, only the broken glass that is still glued and attached. Do NOT use air pillow's, that can burst during shipping. You would not believe some of the packages we receive from customers that get damaged during shipping because they failed to put any packing around the item or use a box almost the same size as the snow globe they shipped. Ship it with UPS, Fed Ex or USPS Postal Service. Pack it well and avoid further damage and expense. * Email address - If you include an email address - We will send you the tracking information when we ship it back to you. 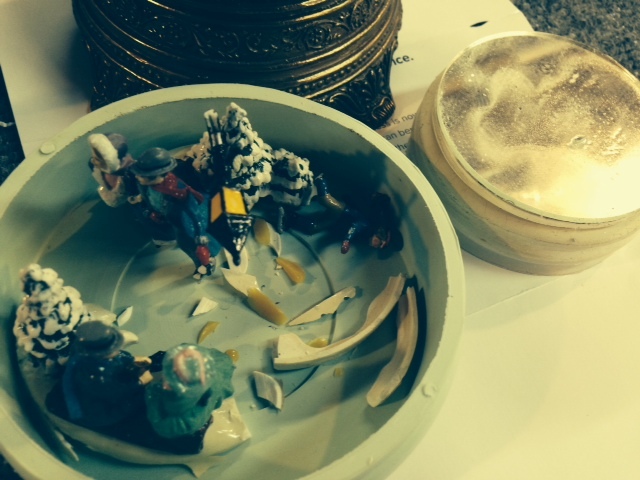 This ice skaters snow globe scene below arrived completely broken in many pieces from England and holds great sentimental value to the owner. So I had to work my magic! She just received it back in the Uk and is thrilled with the completed repair! Read Irene's testimonial in the left side column she sent me. Please note that your snow globe repair will not be shipped until we are completely satisfied with the repair and every attempt to remove air bubbles has been made. Air bubbles are a natural occurence in water and are not considered a defect in workmanship. All snow globes are packed with professional materials bubble wrapped and packed with Styrofoam peanuts for protection during transit. We accept no liability during shipping for any damage that may occur during transit by the shipping carriers. Due to weather conditions, freezing or heat, transit times or delays are beyond our control and also mishandling by the carrier. "Thank you so much for your service on my broken Snoopy snow globe. It is so awesome that you took the time to restore it to new again"
I received the box yesterday and opened it today when my little one is in her summer camp. The box is so fabulous! I really appreciate you mailed it so quickly, thank you very much! I felt like Christmas all over the again – you did a pheonomal job on our memories!!!!! When I open the boxes next year if I find any sick music boxes they are being sent to the true Music Box Elf. I received them on Thursday and I am still having Christmas. Can you send me your website so I can comment about you on my facebook and mark you as one of my favorite companies. Just received my snow globe back from you. It is like brand new. I cant thank you enough. Just wanted to reach out and say thanks for a beautiful restoration of my Mother's nativity mushroom snow globe/music box. It looks brand new! My Mother passed away in August at the age of 94, so this globe -- which I gave her as a gift nearly 20 years ago -- is now mine to remember her by. It will always be a cherished keepsake. I would highly recommend your services and will pass along your business card to the shop where I originally purchased it. In fact, I stopped there first and asked about repairs -- but they had no idea how to do so! I have received my snow globe safe and sound and a big thank you is due to you. It is absolutely fantastic, better than when it was new! I have put it in a very safe place, don’t want it to get broken again, I am thrilled with it and have passed on your details to all my friends. Thank you again, you have made me so happy. Paul-I just received my music box and it is wonderful-after all of these years- Thank goodness I found your web site. Thank you again for your expertise and promptness.